Something was very wrong. 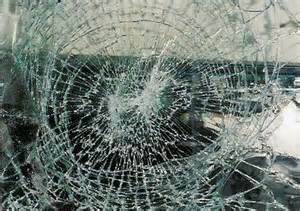 A chill crept over me as I stood, staring at the ominous way the light refracted through the glass…the broken glass of a locked door, in the building where I stood alone. Or did I? My heart started pounding as I realized that the break in had occurred recently, within the two hours or so since I had last stood here – which meant those responsible might still be inside. 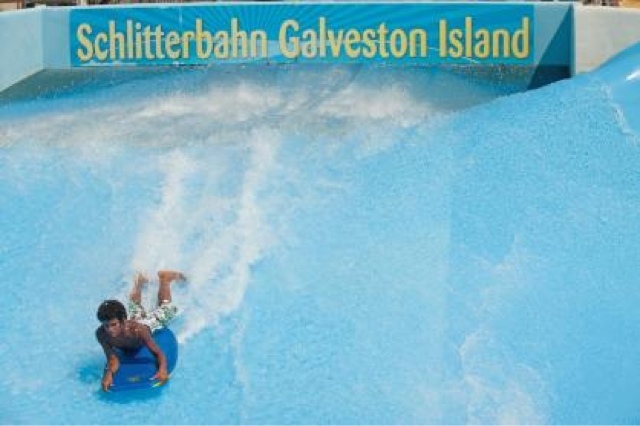 Adrenaline was suddenly racing through my veins. The first thought running through my head: call my husband, who was next door, and pray my phone could get in a signal in the huge metal building – at least if someone hit me over the head, he would know I was there. My second thought – get out. The only problem was that every door required a key to unlock it from the inside, a key I didn’t have. There were only two ways out for me, and both were on the other side of the building. I made a mad dash for the one I had come in through, fear pulsing through my body. I raced back out the way I’d come, now seeing the evidence of a break in that I had overlooked – the overturned boxes, the open doors that should have been closed, the lights turned on. My husband was already in the parking lot, running to meet me as he called 911. We waited outside, shaken to the core. The police came quickly, and caught the would-be burglar, empty-handed and still on the property. He was arrested - so high the police said he’d probably never even remember the events of that afternoon. The police later found out that I was the one who scared him off – he was in the building as I entered, but ran when he heard me, hiding on the property until his arrest. He may not remember, but I will never forget. I’m really good at playing “what if” – a talent that comes in pretty handy when you want to write, but no so great when you face a terrifying experience. I’ve played the game a thousand times since that day, thinking through all the nightmares that could have come true. Even though it happened more than six years ago, I still remember every time I go into that building. That single event, spanning just a few minutes on an otherwise normal day, changed me. I’m much more cautious now and aware of my surroundings at all times. I have a concealed handgun license and routinely carry my gun (a Sig Sauer, in case you’re wondering). I’m never without my cell phone. I won't walk blindly into a situation like that again if I can help it. And every time I think of it – even after six years – it still gives me chills. It's so easy to get overwhelmed. It happens way too often for me. Life starts throwing too much my way, and I find myself stressed out, restless, ready to throw my hands up and run away from it all. A habitat is defined as "a natural home." That is exactly what God should be - our natural home, where we continually stay with Him, where we take shelter in the hard times and find rest in the good times. It can also be defined as a retreat, a place to run for safety. 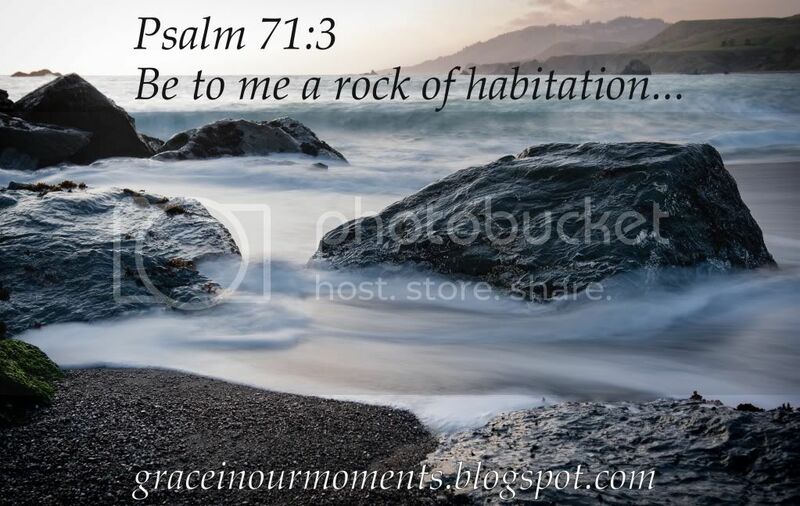 In this verse, rock refers to a fortress or strong hold. It also infers strength and might. God is the strong One, the foundation we can build our lives on. He will help us stand strong. God is our safe place, no matter what storms rage around us. He is the refuge we can run to whenever we need Him. He is our protection. Best of all, we can continually go to God! One definition of "continually" refers to daily, regularly coming to God. He wants us to make Him an integral part of our lives. When we feel stress building and life seems to overwhelm us, we can run to our refuge, over and over again. He will give us strength and keep us safe. This is not my first time to do the challenge - actually, I can't remember if it's my fifth or sixth challenge - but I still find myself struggling from time to time. My biggest challenge isn't getting up early. After finally finishing three years of juggling full-time college with a family and an almost full-time job, a 6:00 a.m. wakeup is considered "sleeping in" for me. I can get up with no problem. What I struggle with is staying focused. Ok, y'all, fess up - I know I'm not the only one who battles distractions! I wrote out a simple schedule a few months ago to help me stay focused. If I find myself wandering, I go back to this. Sure, checking in with my group is important - but spending time in the Word is much more important. Set a timer for your phone or computer time. Limit yourself - whether it's five minutes or thirty minutes, decide what is absolutely essential to start your day, and stick with it. 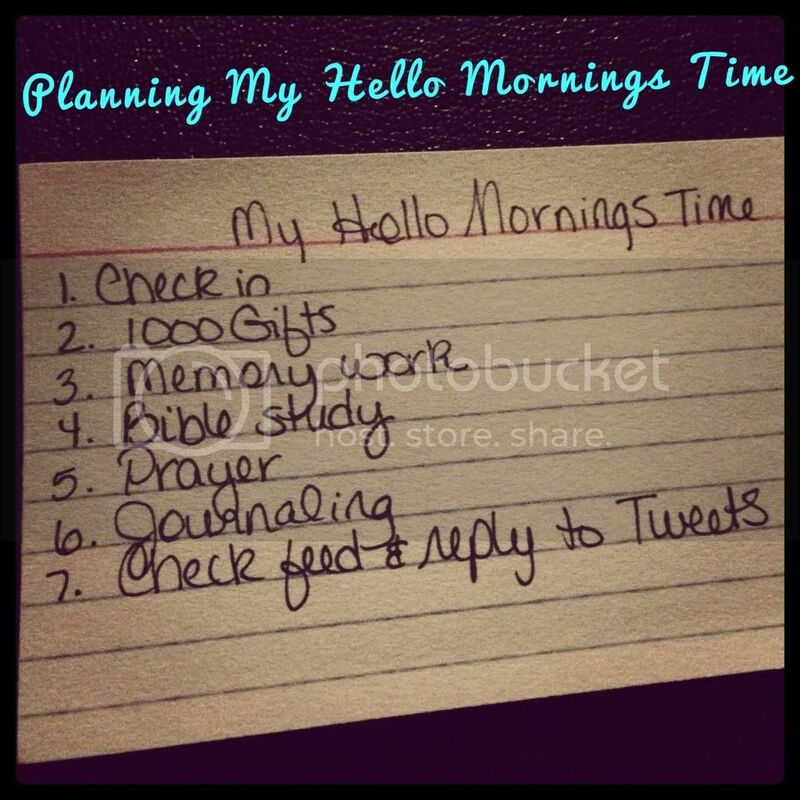 Let your Hello Mornings group know you're struggling. They are there to help you - and they have probably struggled with same issue at some point. Stick with it and finish strong! Every so often, a book comes along that just grabs you and doesn't let go. 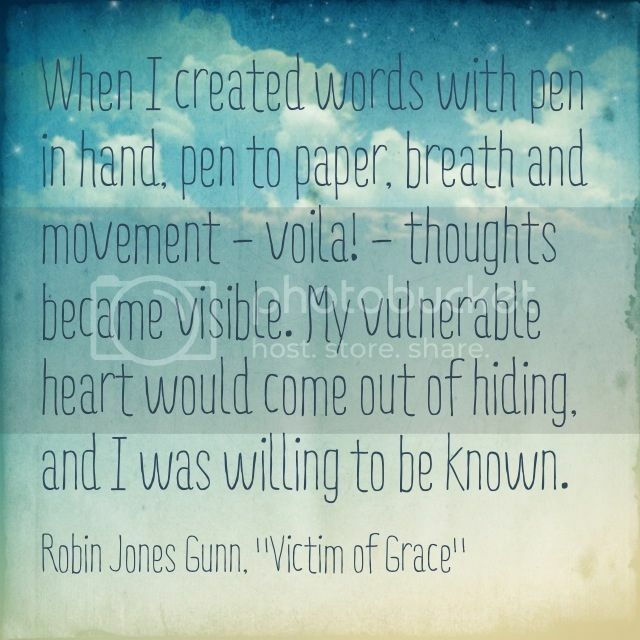 Victim of Grace by Robin Jones Gunn is that kind of book. As I read, I would periodically stop to text a friend and say, "You have to read this!" Other times I stopped to type out a quote to share on Facebook or Instagram. 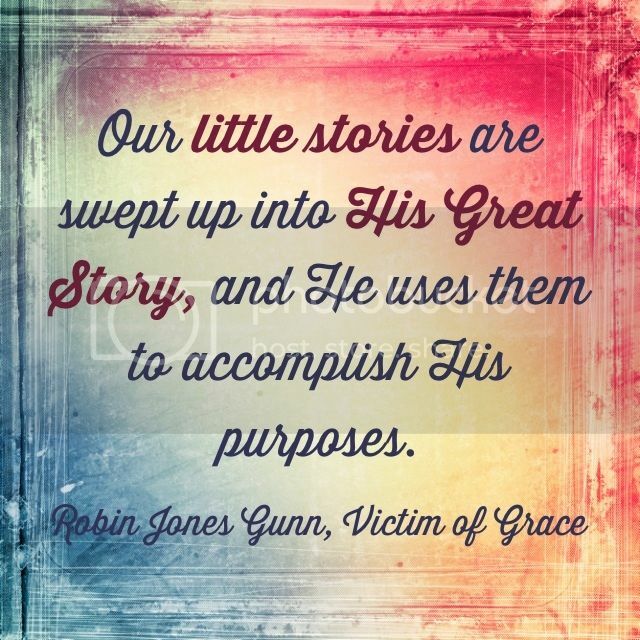 Victim of Grace shares personal stories from Robin Jones Gunn's life, linking each back to a woman in the Bible whose story she related to during that time. She shares both the dark times and the good times in her life, but through it all, she shows how God's goodness prevails. 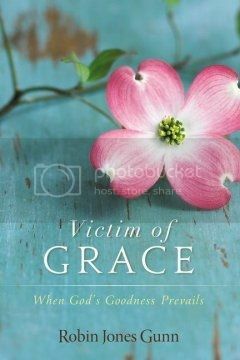 She discusses how we lost our "covering of grace" in the fall and how we need to be honest with God, receiving the provisions He has for us. She also shares a lot of her experiences with writing. She talks about where many of her book ideas came from, as well as her writing habits and how she made time for writing in the middle of raising children and caring for her father as his health declined. I would highly recommend this book to anyone. It's one of those books you'll find yourself sitting down periodically so you can soak in what you're reading. You won't regret it!